An ocean planet, ocean world, water world, aquaplanet or panthalassic planet is a type of terrestrial planet that contains a substantial amount of water either at its surface or subsurface. The term ocean world is also used sometimes for astronomical bodies with an ocean composed of a different fluid, such as lava (the case of Io), ammonia (the case of Titan's inner ocean) or ethane (which could be the most abundant kind of exosea). Earth is the only astronomical object known to have bodies of liquid water on its surface, although several exoplanets have been found with the right conditions to support liquid water. For exoplanets, current technology cannot directly observe liquid surface water, so atmospheric water vapor may be used as a proxy. The characteristics of ocean worlds—or ocean planets—provide clues to their history, and the formation and evolution of the Solar System as a whole. Of additional interest is their potential to originate and host life. Water worlds are of extreme interest to astrobiologists for their potential to develop life and sustain biological activity over geological timescales. The five best established water worlds in the Solar System include Europa, Enceladus, Ganymede, and Callisto. A host of other bodies in the outer Solar System are inferred by a single type of observation or by theoretical modeling to have subsurface oceans, and these include: Dione, Pluto, Triton, and Ceres, as well as Mimas, Eris, and Oberon. 3) was present. Peale and Cassen figured out in 1979 the important role of tidal heating (aka: tidal flexing) on satellite evolution and structure. The first confirmed detection of an exoplanet was in 1992. Alain Léger et al figured in 2004 that a small number of icy planets that form in the region beyond the snow line can migrate inward to ∼1 AU, where the outer layers subsequently melt. The cumulative evidence collected by the Hubble Space Telescope, as well as Pioneer, Galileo, Voyager, Cassini–Huygens, and New Horizons missions, strongly indicate that several outer Solar System bodies harbour internal liquid water oceans under an insulating ice shell. Meanwhile, the Kepler space observatory, launched in March 7, 2009, has discovered thousands of exoplanets, about 50 of them of Earth-size in or near habitable zones. Planets of almost all masses, sizes, and orbits have been detected, illustrating not only the variable nature of planet formation but also a subsequent migration through the circumstellar disc from the planet's place of origin. As of 1 April 2019, there are 4,023 confirmed planets in 3,005 systems, with 656 systems having more than one planet. Planets that form prior to the dissipation of the gaseous circumstellar disk experience strong torques that can induce rapid inward migration into the habitable zone, especially for planets in the terrestrial mass range. Since water is highly soluble in magma, a large fraction of the planet's water content will initially be trapped in the mantle. As the planet cools and the mantle begins to solidify from the bottom up, large amounts of water (between 60% and 99% of the total amount in the mantle) are exsolved to form a steam atmosphere, which may eventually condense to form an ocean. Ocean formation requires differentiation, and a heat source, either radioactive decay, tidal heating, or the early luminosity of the parent body. Unfortunately, the initial conditions following accretion are theoretically incomplete. Planets that formed in the outer, water-rich regions of a disk and migrated inward are more likely to have abundant water. Conversely, planets that formed close to their host stars are less likely to have water because the primordial disks of gas and dust are thought to have hot and dry inner regions. So if a water world is found close to a star, it would be strong evidence for migration and ex situ formation, because insufficient volatiles exist near the star for in situ formation. Simulations of Solar System formation and of extra-solar system formation have shown that planets are likely to migrate inward (i.e., toward the star) as they form. Outward migration may also occur under particular conditions. Inward migration presents the possibility that icy planets could move to orbits where their ice melts into liquid form, turning them into ocean planets. This possibility was first discussed in the astronomical literature by Marc Kuchner and Alain Léger in 2004. The internal structure of an icy astronomical body is generally deduced from measurements of its bulk density, gravity moments, and shape. Determining the moment of inertia of a body can help assess whether it has undergone differentiation (separation into rock-ice layers) or not. Shape or gravity measurements can in some cases be used to infer the moment of inertia – if the body is in hydrostatic equilibrium (i.e. behaving like a fluid on long timescales). However, proving that a body is in hydrostatic equilibrium is extremely difficult, but by using a combination of shape and gravity data, the hydrostatic contributions can be deduced. Specific techniques to detect inner oceans include magnetic induction, geodesy, librations, axial tilt, tidal response, radar sounding, compositional evidence, and surface features. Artist's cut-away representation of the internal structure of Ganymede, with a liquid water ocean "sandwiched" between two ice layers. Layers drawn to scale. A generic icy moon will consist of a water layer sitting atop a silicate core. For a small satellite like Enceladus, an ocean will sit directly above the silicates and below a solid icy shell, but for a larger ice-rich body like Ganymede, pressures are sufficiently high that the ice at depth will transform to higher pressure phases, effectively forming a "water sandwich" with an ocean located between ice shells. An important difference between these two cases is that for the small satellite the ocean is in direct contact with the silicates, which may provide hydrothermal and chemical energy and nutrients to simple life forms. Because of the varying pressure at depth, models of a water world may include "steam, liquid, superfluid, high-pressure ices, and plasma phases" of water. Some of the solid-phase water could be in the form of ice VII. Maintaining a subsurface ocean depends on the rate of internal heating compared with the rate at which heat is removed, and the freezing point of the liquid. Ocean survival and tidal heating are thus intimately linked. Smaller ocean planets would have less dense atmospheres and lower gravity; thus, liquid could evaporate much more easily than on more massive ocean planets. Simulations suggest that planets and satellites of less than one Earth mass could have liquid oceans driven by hydrothermal activity, radiogenic heating, or tidal flexing. Where fluid-rock interactions propagate slowly into a deep brittle layer, thermal energy from serpentinization may be the primary cause of hydrothermal activity in small ocean planets. The dynamics of global oceans beneath tidally flexing ice shells represents a significant set of challenges which have barely begun to be explored. The extent to which cryovolcanism occurs is a subject of some debate, as water, being denser than ice by about 8%, has difficulty erupting under normal circumstances. To allow water to be liquid for long periods of time, a planet —or moon— must orbit within the habitable zone (HZ), possess a protective magnetic field, and have the gravitational pull needed to retain an ample amount of atmospheric pressure. If the planet gravity cannot sustain that, then all the water will eventually evaporate into the outer space. A strong planetary magnetosphere, maintained by internal dynamo action in an electrically conducting fluid layer, is helpful for shielding the upper atmosphere from stellar wind mass loss and retaining water over long geological time scales. A planet's atmosphere forms from outgassing during planet formation or is gravitationally captured from the surrounding protoplanetary nebula. The surface temperature on an exoplanet is governed by the atmosphere's greenhouse gases (or lack thereof), so an atmosphere can be detectable in the form of upwelling infrared radiation because the greenhouse gases absorb and re-radiate energy from the host star. Ice-rich planets that have migrated inward into orbit too close to their host stars may develop thick steamy atmospheres but still retain their volatiles for billions of years, even if their atmospheres undergo slow hydrodynamic escape. Ultraviolet photons are not only biologically harmful but can drive fast atmospheric escape that leads to the erosion of planetary atmospheres; photolysis of water vapor, and hydrogen/oxygen escape to space can lead to the loss of several Earth oceans of water from planets throughout the habitable zone, regardless of whether the escape is energy-limited or diffusion-limited. The amount of water lost seems proportional with the planet mass, since the diffusion-limited hydrogen escape flux is proportional to the planet surface gravity. During a runaway greenhouse effect, water vapor reaches the stratosphere, where it is easily broken down (photolyzed) by ultraviolet radiation (UV). Heating of the upper atmosphere by UV radiation can then drive a hydrodynamic wind that carries the hydrogen (and potentially some of the oxygen) to space, leading to the irreversible loss of a planet's surface water, oxidation of the surface, and possible accumulation of oxygen in the atmosphere. The fate of a given planet's atmosphere strongly depends on the extreme ultraviolet flux, the duration of the runaway regime, the initial water content, and the rate at which oxygen is absorbed by the surface. Volatile-rich planets should be more common in the habitable zones of young stars and M-type stars. 2 and for atmospheric relative humidity, redox state of the planetary surface and interior, acidity levels of the oceans, planetary albedo, and surface gravity. 2 are needed to warm the surface temperature above freezing, leading to a scaled surface pressure of 0.56–1.32 times Earth's. Outside the Solar System, Kepler-11, GJ 1214 b, Kepler-22b, Kepler-62f, Kepler-62e and the planets of TRAPPIST-1 are some of most likely known candidates for an extrasolar ocean planet. Many more such objects are expected to be discovered by Kepler. Although 70.8% of all Earth's surface is covered in water, water accounts for only 0.05% of Earth's mass. An extraterrestrial ocean's depth would be so deep and dense that even at high temperatures the pressure would turn the water into ice. The immense pressures in the lower regions of these oceans could lead to the formation of a mantle of exotic forms of ice such as ice V. This ice would not necessarily be as cold as conventional ice. If the planet is close enough to its star that the water reaches its boiling point, the water will become supercritical and lack a well-defined surface. Even on cooler water-dominated planets, the atmosphere can be much thicker than that of Earth, and composed largely of water vapor, producing a very strong greenhouse effect. Such planets would have to be small enough not to be able to retain a thick envelope of hydrogen and helium, or be close enough to their primary star to be stripped of these light elements. Otherwise, they would form a warmer version of an ice giant instead, like Uranus and Neptune. The characteristics of ocean worlds or ocean planets provide clues to their history, and the formation and evolution of the Solar System as a whole. Of additional interest is their potential to form and host life. Life as we know it requires liquid water, a source of energy and nutrients, and all three key requirements can potentially be satisfied within some of these bodies, that may offer the possibility for sustaining simple biological activity over geological timescales. In August 2018, researchers reported that water worlds could support life. An ocean world's habitation by Earth-like life is limited if the planet is completely covered by liquid water at the surface, even more restricted if a pressurized, solid ice layer is located between the global ocean and the lower rocky mantle. Simulations of a hypothetical ocean world covered by 5 Earth oceans' worth of water indicate the water would not contain enough phosphorus and other nutrients for Earth like oxygen-producing ocean organisms such as plankton to evolve. On Earth, phosphorus is washed into the oceans by rainwater hitting rocks on exposed land so the mechanism would not work on an ocean world. Simulations of ocean planets with 50 Earth oceans' worth of water indicate the pressure on the sea floor would be so immense that the planet's interior would not sustain plate tectonics, volcanism to provide the right chemical environment for terrestrial life. On the other hand, small bodies such as Europa and Enceladus are regarded as particularly habitable environments because their oceans are in direct contact with the underlying silicate core, a potential source of both heat, and biologically important chemical elements. The surface geological activity of these bodies may also lead to the transport to the oceans of biologically-important building blocks implanted at the surface, such as organic molecules from comets or tholins —formed by solar ultraviolet irradiation of simple organic compounds such as methane or ethane, often in combination with nitrogen. 2-rich planet, organisms would have to compete with the oxygen for this free energy. ^ Definition of Ocean planet. Retrieved 1 October 2017. ^ a b Adams, E. R.; Seager, S.; Elkins-Tanton, L. (1 February 2008). "Ocean Planet or Thick Atmosphere: On the Mass-Radius Relationship for Solid Exoplanets with Massive Atmospheres". The Astrophysical Journal. 673 (2): 1160–1164. arXiv:0710.4941. Bibcode:2008ApJ...673.1160A. doi:10.1086/524925. A planet with a given mass and radius might have substantial water ice content (a so-called ocean planet), or alternatively a large rocky iron core and some H and/or He. ^ a b c d e f g h i j k l m n o p Nimmo, F.; Pappalardo, R. T. (8 August 2016). "Ocean worlds in the outer solar system" (PDF). Journal of Geophysical Research. 121 (8): 1378. Bibcode:2016JGRE..121.1378N. doi:10.1002/2016JE005081. Retrieved 2017-10-01. ^ [Ocean Worlds: The story of seas on Earth and other planets]. By Jan Zalasiewicz and Mark Williams. OUP Oxford, October 23, 2014. ISBN 019165356X, 9780191653568. ^ a b "Are there oceans on other planets?". National Oceanic and Atmospheric Administration. 6 July 2017. Retrieved 2017-10-03. ^ a b c d e f Seager, Sara (2013). "Exoplanet Habitability". Science. 340 (577): 577–581. Bibcode:2013Sci...340..577S. doi:10.1126/science.1232226. PMID 23641111. ^ "Water-worlds are common: Exoplanets may contain vast amounts of water". Phys.org. 17 August 2018. Retrieved 17 August 2018. ^ McEwen, Alfred (1 February 2016). "Roadmaps to Ocean Worlds (ROW)" (PDF). Lunar and Planetary Institute. Retrieved 2017-09-30. ^ Creech, Stephen D; Vane, Greg. "Ocean World Exploration and SLS: Enabling the Search for Life". Nasa Technical Reports Server. NASA. Retrieved 2017-09-30. ^ Anderson, Paul Scott (15 May 2015). "'Ocean Worlds Exploration Program': New Budget Proposal Calls for Missions to Europa, Enceladus, and Titan". AmericaSpace. Retrieved 2017-09-30. ^ Wenz, John (19 May 2015). "NASA Wants to go Underwater Exploring on Ocean Moons". Popular Mechanics. Retrieved 2017-09-30. ^ Berger, Eric (19 May 2015). "The House budget for NASA plants the seeds of a program to finally find life in the outer solar system". Chron. Retrieved 2017-09-30. ^ Ocean Worlds. JPL, NASA. ^ a b Kennedy, Grant M.; Kenyon, Scott J (20 January 2008). "Planet Formation around Stars of Various Masses: The Snow Line and the Frequency of Giant Planets". The Astrophysical Journal. 673 (1): 502–512. arXiv:0710.1065. Bibcode:2008ApJ...673..502K. doi:10.1086/524130. ^ Greenberg, Richard (2005) Europa: The Ocean Moon: Search for an Alien Biosphere, Springer + Praxis Books, ISBN 978-3-540-27053-9. ^ Overbye, Dennis (May 12, 2013). "Finder of New Worlds". The New York Times. Retrieved May 13, 2014. ^ Overbye, Dennis (January 6, 2015). "As Ranks of Goldilocks Planets Grow, Astronomers Consider What's Next". The New York Times. Retrieved January 6, 2015. ^ a b c d e f Kuchner, Marc (2003). "Volatile-rich Earth-Mass Planets in the Habitable Zonene". Astrophysical Journal. 596 (1): L105–L108. arXiv:astro-ph/0303186. Bibcode:2003ApJ...596L.105K. doi:10.1086/378397. ^ a b c d D'Angelo, G.; Bodenheimer, P. (2016). "In Situ and Ex Situ Formation Models of Kepler 11 Planets". The Astrophysical Journal. 828 (1): in press. arXiv:1606.08088. Bibcode:2016ApJ...828...33D. doi:10.3847/0004-637X/828/1/33. ^ Tanaka, H.; Takeuchi, T.; Ward, W. R. (2002). "Three-Dimensional Interaction between a Planet and an Isothermal Gaseous Disk. I. Corotation and Lindblad Torques and Planet Migration". The Astrophysical Journal. 565 (2): 1257–1274. Bibcode:2002ApJ...565.1257T. doi:10.1086/324713. ^ a b Lubow, S. H.; Ida, S. (2011). "Planet Migration". In S. Seager. (ed.). Exoplanets. University of Arizona Press, Tucson, AZ. pp. 347–371. arXiv:1004.4137. Bibcode:2011exop.book..347L. ^ a b c Léger, Alain (2004). "A New Family of Planets ? "Ocean Planets"". Icarus. 169 (2): 499–504. arXiv:astro-ph/0308324. Bibcode:2004Icar..169..499L. doi:10.1016/j.icarus.2004.01.001. ^ Rogers, L.A.; Seager, S. (2010). "Three Possible Origins for the Gas Layer on GJ 1214b". The Astrophysical Journal (abstract). 716 (2): 1208–1216. arXiv:0912.3243. Bibcode:2010ApJ...716.1208R. doi:10.1088/0004-637X/716/2/1208. ^ David A. Aguilar (2009-12-16). "Astronomers Find Super-Earth Using Amateur, Off-the-Shelf Technology". Harvard-Smithsonian Center for Astrophysics. Retrieved December 16, 2009. ^ a b Driscoll, Peter (May 2011). "Optimal dynamos in the cores of terrestrial exoplanets: Magnetic field generation and detectability". Icarus. 213 (1): 12–23. Bibcode:2011Icar..213...12D. doi:10.1016/j.icarus.2011.02.010. ^ Hydrogen green house planets beyond the Habitable Zone. Raymond Pierrehumbert, and Eric Gaidos. The Astrophysical Journal Letters. 19 May 2011. ^ Kuchner, Marc J. (10 October 2003). "Volatile-rich Earth-Mass Planets in the Habitable Zone". The Astrophysical Journal Letters. 506. ^ F. Kasting, D. Catling, Annu. Rev. Astron. Astrophys. 41, 429 (2003). ^ David Charbonneau; Zachory K. Berta; Jonathan Irwin; Christopher J. Burke; et al. (2009). "A super-Earth transiting a nearby low-mass star". Nature. 462 (17 December 2009): 891–894. arXiv:0912.3229. Bibcode:2009Natur.462..891C. doi:10.1038/nature08679. PMID 20016595. ^ Kuchner, Seager; Hier-Majumder, M.; Militzer, C. A. (2007). "Mass–radius relationships for solid exoplanets". The Astrophysical Journal. 669 (2): 1279–1297. arXiv:0707.2895. Bibcode:2007ApJ...669.1279S. doi:10.1086/521346. ^ Rincon, Paul (5 December 2011). "A home from home: Five planets that could host life". BBC News. Retrieved 26 November 2016. ^ Bourrier, Vincent; de Wit, Julien; Jäger, Mathias (31 August 2017). "Hubble delivers first hints of possible water content of TRAPPIST-1 planets". www.SpaceTelescope.org. Retrieved 4 September 2017. ^ PTI (4 September 2017). "First evidence of water found on TRAPPIST-1 planets – The results suggest that the outer planets of the system might still harbour substantial amounts of water. This includes the three planets within the habitable zone of the star, lending further weight to the possibility that they may indeed be habitable". The Indian Express. Retrieved 4 September 2017. ^ Pidwirny, M. "Surface area of our planet covered by oceans and continents. (Table 8o-1)". University of British Columbia, Okanagan. 2006. Retrieved May 13, 2016. ^ Staff (1 September 2018). 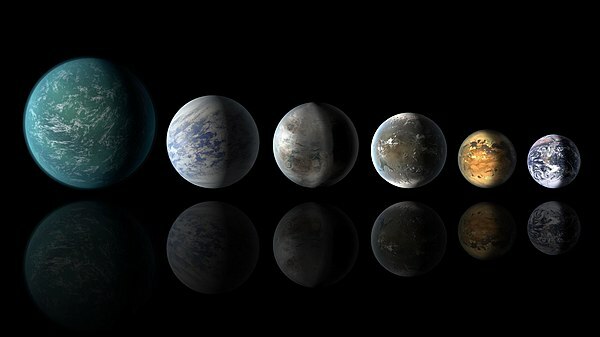 "Water worlds could support life, study says - Analysis by UChicago, Penn State scientists challenges idea that life requires 'Earth clone'". EurekAlert. Retrieved 1 September 2018. ^ Kite, Edwin S.; Ford, Eric B. (31 August 2018). "Habitability of Exoplanet Waterworlds". The Astrophysical Journal. 864: 75. arXiv:1801.00748. doi:10.3847/1538-4357/aad6e0. ^ Franck, S.; Cuntz, M.; von Bloh, W.; Bounama, C. (January 2003). "The habitable zone of Earth-mass planets around 47 UMa: results for land and water worlds". International Journal of Astrobiology. 2 (1): 35–39. Bibcode:2003IJAsB...2...35F. doi:10.1017/S1473550403001368. Retrieved 2017-10-01. ^ "Water Worlds and Ocean Planets". Solsation.com. 2013. Retrieved January 7, 2016. ^ Witze, Alexandra (23 November 2017). "Exoplanet hunters rethink search for alien life". Nature. 551 (23 November 2017): 421–422. Bibcode:2017Natur.551..421W. doi:10.1038/nature.2017.23023. PMID 29168837. ^ Sarah Hörst, "What in the world(s) are tholins? ", Planetary Society, July 23, 2015. Retrieved 30 Nov 2016. F. Selsis; B. Chazelas; P. Borde; M. Ollivier; et al. (2007). "Could we identify hot Ocean-Planets with CoRoT, Kepler and Doppler velocimetry?". Icarus. 191 (2): 453–468. arXiv:astro-ph/0701608. Bibcode:2007Icar..191..453S. doi:10.1016/j.icarus.2007.04.010.